A SPIRITED fielding performance has helped Papua New Guinea to an emotional 11-run victory over Ireland in their third and final Twenty20 International at Tony Ireland Stadium on Tuesday. The series was already lost, but PNG still had everything to play for after captain Jack Vare was forced to fly home following the tragic death of his sister. Sporting black armbands in tribute, the resolute Barramundis made their best start of the tour as stand-in captain Assad Vala (7) and Vani Morea (19) put on a 26-run opening partnership. Things quickly turned sour as they slipped to 3-28 against the sharp bowling of Tim Murtagh (3-23) and George Dockrell (2-15), but Sese Bau and Mahuru Dai dug in with a stand of 48 to bring PNG back into the contest. 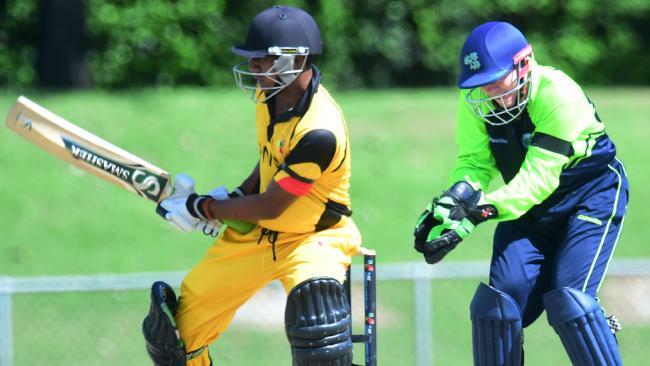 Ireland’s bowlers chipped away to reduce them 7-90 before Charles Amini’s run-a-ball 24 helped PNG blast 26 off the last three overs to reach a defendable 8-116. In reply, Ireland lost their openers to a blistering spell from Chad Soper (3-13) before Niall O’Brien (27) and Gary Wilson (15) — who was making his 200th appearance for Ireland — salvaged the innings with a 31-run partnership. The runs dried up in the middle overs as Charles Amini (2-13) and Dai (2-26) kept Ireland from finding the boundary for 36 balls. Stuart Thompson (10) finally opened the shoulders to slap Dai over extra-cover for six, but he was out next ball as he popped a simple catch to point and Ireland was soon staring down defeat at a precarious 9-92. Andy McBrine (10*) and Murtagh (8) kept the scoreboard ticking over with a run-a-ball last-wicket stand of 13 before star paceman Soper finished Ireland off with the first ball of the 20th over. PNG all-rounder Amini said the win was a proud moment for the relatively inexperienced team and a fitting tribute for their captain. “Our captain Jack lost his sister so he had to fly back. We put this game in for her and Jack’s family. We were very proud,” Amini said. “Even though we had a low target that we put up, our bowlers really put all the effort in. The wicket wasn’t easy to bat on, but we fought really hard. We really wanted to finish off this tour with a win and that we did. It was a disappointing result for Ireland, which also named its squad for next month’s ICC World T20 in India yesterday, but batsman Niall O’Brien was confident they can bounce back quickly. “PNG are really improving and in the field they’re fantastic. Unfortunately they were a lot better than us today,” he said. “I thought our bowlers did well, but our fielding was a little bit off and then with the bat we just didn’t apply the basics. “That’s the way it goes sometimes in T20. We’ve got to dust ourselves off and prepare for World Cup in India.